Need something just a bit bigger? Try the Cruiser-Mate! 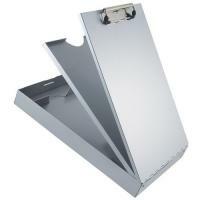 This lightweight aluminum clipboard and portable office is widely used and very popular among law enforcement because of its unique features and durability. The low profile clip holds paper securely, and allows it to be stored in a saddle bag, seat pocket or back pack. This strong, metal clip will keep your items where you want them, even on a windy day. The Saunders Cruiser-Mate has a top opening design to make it easier to get to the items you need, even with one hand. Inside, it has two storage compartments that offer plenty space for your forms, office supplies and accessories. The top compartment will hold up to &frac716 of paper and is free floating for ease access and allows you to separate used forms or other reports. The bottom tray is almost 1 deep so keep all your items together such as your tablet, smartphone, keys and more. This tray is removable for even more storage. Plus, it has a pen tray for little necessities. The Cruiser-Mate has a unique patented clip that has a self-locking latch that keeps the compartments securely fastened, preventing items from falling out. Best of all, it is manufactured proudly in the USA, from durable recycled aluminum with at least 50% post-consumer waste so this product can take a beating and continue to give many years of organization. New convenient top open design! Good, solid and extra features to make this both usable and convenient.